Last week, the producers pulled out the first nonelimination leg of the season and bit earlier than usual. The beneficiaries of Phil’s benevolence were father and son Michael & Kevin. Their struggles in Ghana were truly befitting of a last place finish. 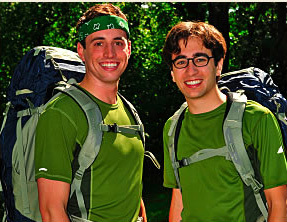 But their stay of Amazing Race execution gives them a shot at redemption. Let’s just hope their Speed Bump task isn’t more difficult than rolling a bike rim with a stick. We kick off this episode with some footage of how the teams "chose" to spend their pitstop break – by helping paint and fix up the Ghana school they visited on the previous leg. This immediately reminded me of Survivor: Africa when Lex won the new truck and delivered medical supplies. It was a very feel-good Extreme Makeover: Home Edition moment. But you’re here for the Amazing Race and not the human race, right? The producers give me a break from having to follow when and in what order each of the teams leave thanks to a lack of flights from West Africa to the ARCTIC CIRCLE. More specifically, they are heading to northern Sweden but still. The most significant revelation is that Team Glee Connor & Jonathan are actually missing their Princeton graduation to be on the race. In fact, their graduation is apparently being held during this leg. Because of the travel limitations, each team is booked on the same flight connecting through Frankfurt, Germany, but aren’t required to use the tickets. As the teams congregate at the Lufthansa counter waiting for them to open, last place (and future Speed Bumpers) Michael & Kevin use their cabbie’s phone to check on an earlier connection in Germany.